I first “met” rag rugger Stephanie Gaston by email back in 2017. She had bought a pair of my Ragged Life Rag Rug Scissors online and sent me a very kind email to tell me how much she loved them. 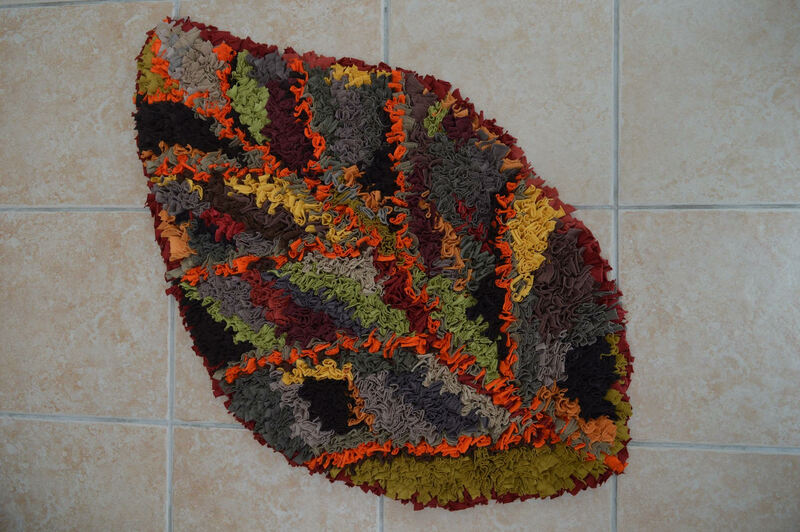 We sent a few emails back and forth and I soon discovered that she’d made tonnes of beautiful rag rug creations. Even though I’ve been lucky enough to see quite a few of Stephanie’s creations over the course of our email friendship, it seemed a shame that no one else had had the opportunity. So, now I’m rectifying that. Below is a Q&A and artwork showcase of Stephanie’s work. Lovely rag rugging by a lovely lady. Hi Stephanie, would you mind telling us a little about yourself and your background please? I have always been into sewing and knitting from an early age. I used to make outfits for my dolls and my brother’s Action Man. 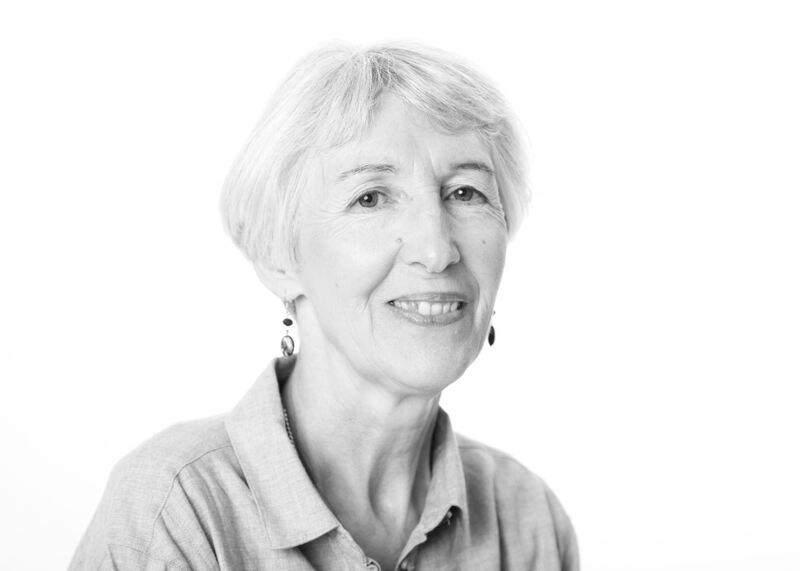 My mum taught me to knit and crochet and I had the job of sewing things up and stitching in all the ends of the many cardigans and jumpers my mum made for herself, myself and my brother and sister. Later on, my parents bought a wool shop, which was absolute heaven! And how did you get into rag rugging? I was introduced to rag rugging by a friend who was moving on to other crafts. She gave me some basic instructions, her rug tool and boxes of rags. I started to do craft fairs to sell things but found that people were more interested in learning how to do the rag rugging rather than buying, so I started holding workshops locally which led to giving talks to local W.I.s, which I now really enjoy. 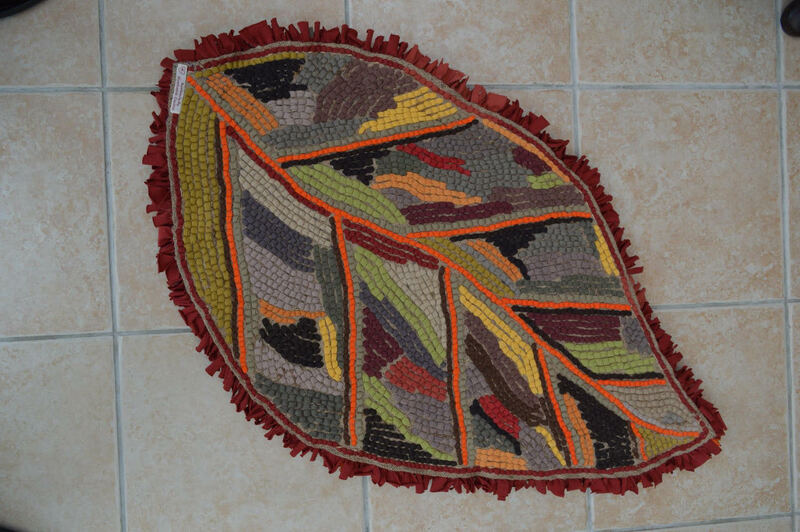 Stephanie had a lot of fun making this leaf rag rug. What do you enjoy most about rag rugging? I love being able to make something special from recycled textiles, which I mainly source from charity shops and donations from friends. I love the link with the past and take every opportunity to add to my extensive library of books. I also enjoy sharing my skills with others, especially children. 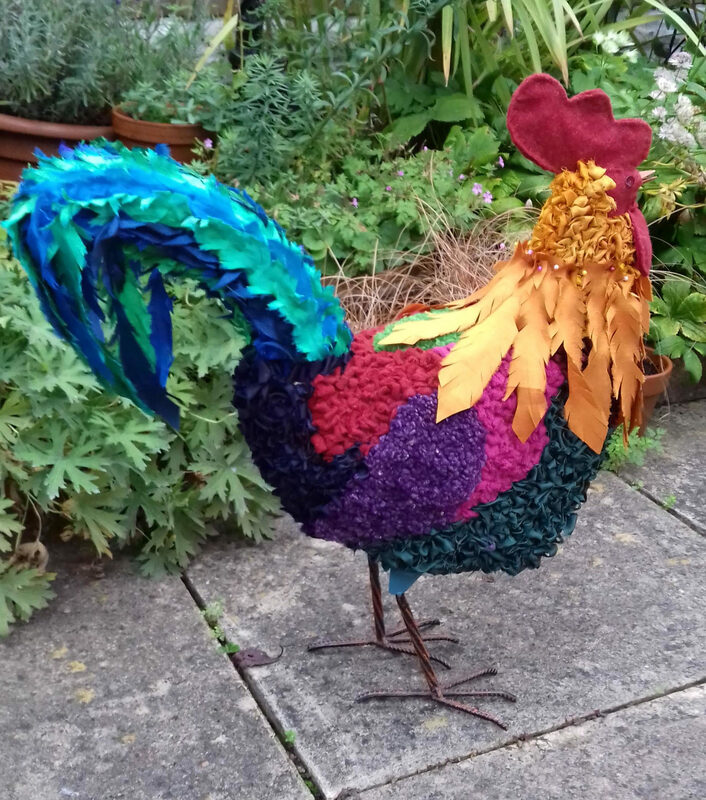 This is ‘Cyril’, Stephanie’s first piece of 3D rag rugging, which was bought by a lady who keeps chickens whose neighbour’s objected to a cockerel so he has pride of place in her window. The money went to a local wildlife centre. I get my design inspiration from anything and everything… a view perhaps, even a grating or manhole cover. Church architecture is a favourite with the amazing colours in stained glass windows and beautiful brickwork. I keep a notebook with me to jot down ideas and sketches. 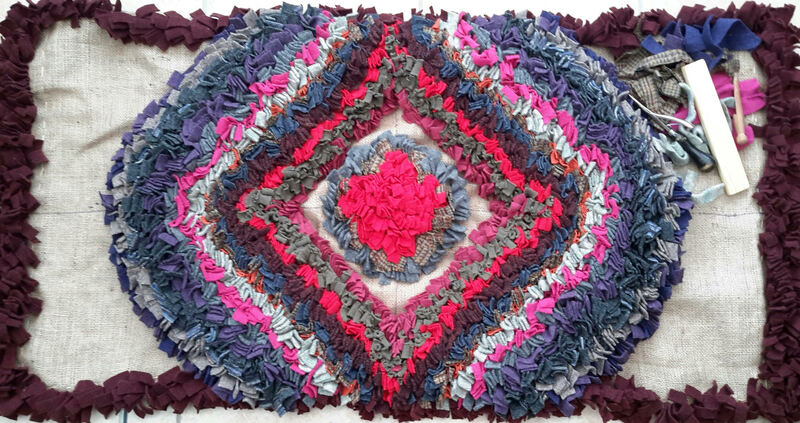 This piece was inspired by a rag rug on the floor in a tin chapel where Stephanie Gaston was staying at Walcott Hall, Shropshire. It is made using recycled woollen jumpers. How do you go about starting a new project? Do you plan everything meticulously or do you kind of improvise? When I start a new project, size is very important especially if I have to take it out and about for demonstrations. I decide on a subject and then work out the scale needed for it to work deciding how much detail I want to show. I have colours in mind but may change these along the way if I am not happy with the effect or have trouble finding sufficient fabrics to fill an area. Do you use old clothing for your rag rugs or have to find some other way of sourcing your materials? Most of my textiles for rag rugging come from charity shops but now I am known for making rag rugs I have several crafty friends who give me scraps of the most beautiful fabrics. I get Harris Tweed, cashmere, and upholstery fabrics and a dressmaker friend even collects all the bits and pieces from her classes for me so I am really spoilt for choice sometimes. 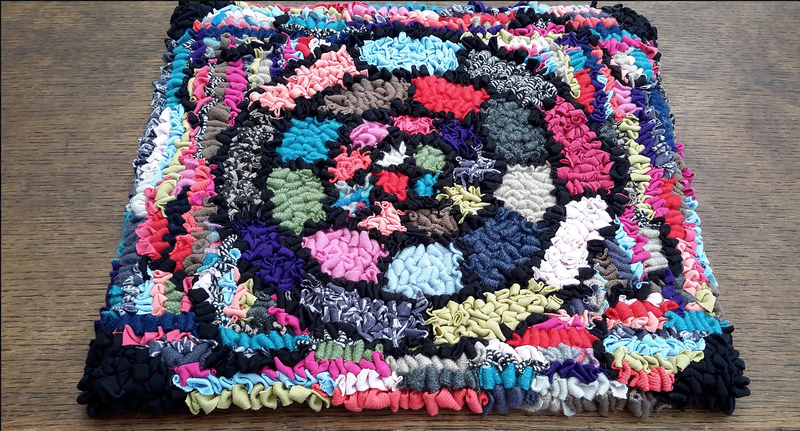 This circular rag rug was made entirely out of t-shirts. Stephanie had to dye white t-shirts to get the amount of green she needed. Are there any fabrics that you particularly enjoy working with? Are there any you avoid? My favourite fabrics to work with are t-shirts (jersey), acrylic jumpers and woollen jumpers. I would rather not work with thick fabrics such as denim and those that fray too much. 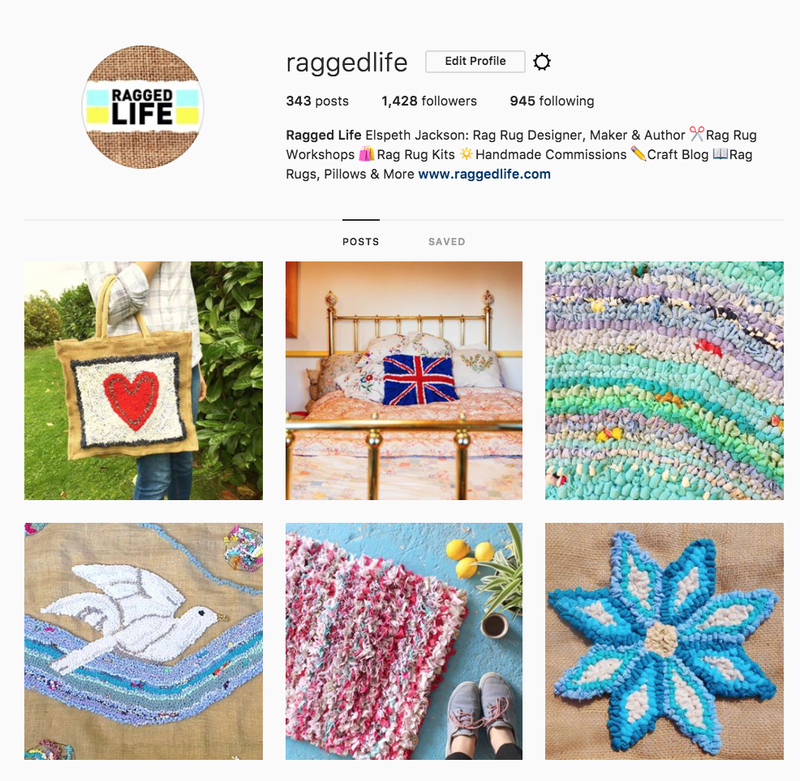 Which is your favourite rag rug piece and why? 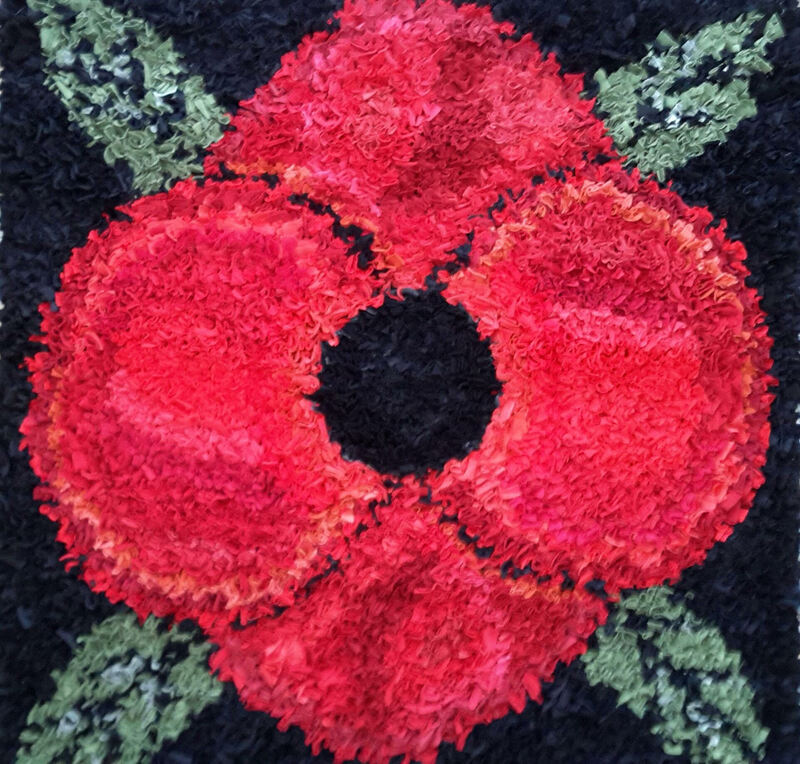 My favourite rag rug piece is my one metre square poppy rug which I made several years ago. I had to ask advice from a local painter as I was struggling to get the effect I wanted with the amount of t-shirts I needed for the project and so many shades of red. Her advice was invaluable and I am really pleased with the final result. I now use the image for my logo and business cards and it was even used as part of a poppy day display one year. 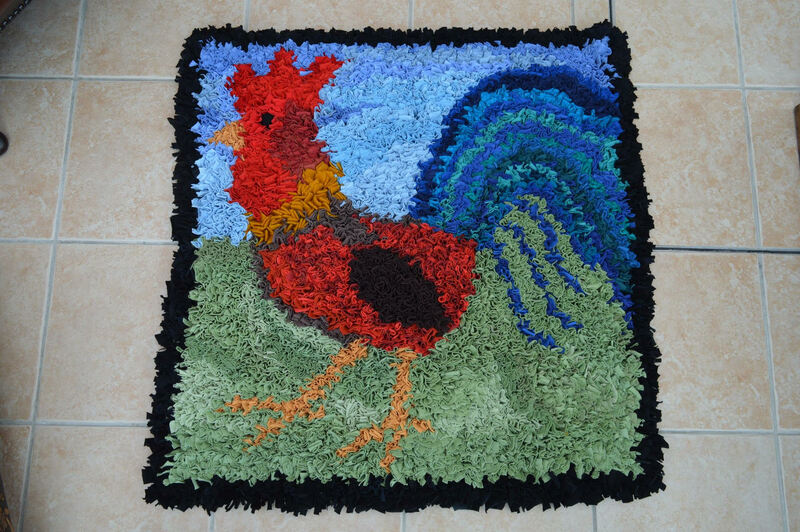 Stephanie was really pleased with the shading in this particular rag rug. 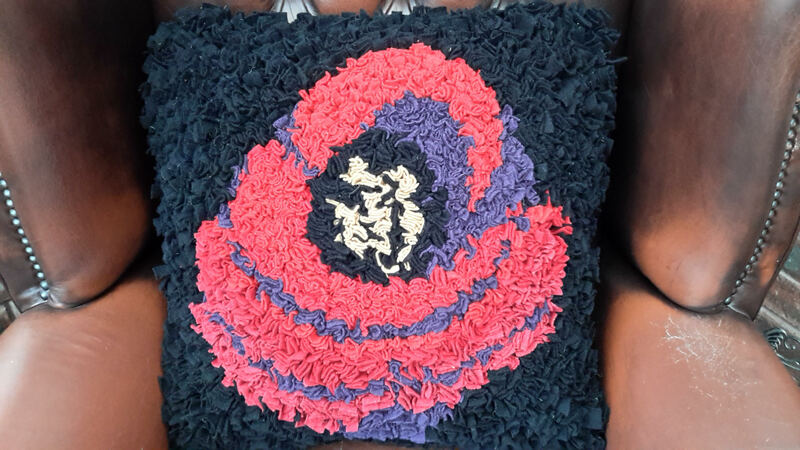 This was a poppy cushion Stephanie made inspired by her original rug. What is your least favourite part of the rag rugging process? My least favourite part of the rag rugging process is filling large areas of one colour so now I try to make my design fill the space. Stephanie tries to stretch the design as close to the border as possible so that she doesn’t have large areas of block colour to fill. She had to alter the original design a few times to keep the definition especially in his head. There are several people whose work I love Lynne Stein, Deanne Fitzpatrick and Kaffe Fassett to name a few. Other crafts I love are spinning and weaving, which I am hoping to use in my rug making in the future. Any that you haven’t done yet but would love to try if you had the time? I fancy having a go at watercolour painting and making mosaics if I can find the time. What are you working on at the moment? Can you share any work in progress photos? The piece I am working on at the moment is a Picasso inspired self-portrait. It started off as a rug but I have decided I would prefer it to be a wall hanging as the head is the main part. 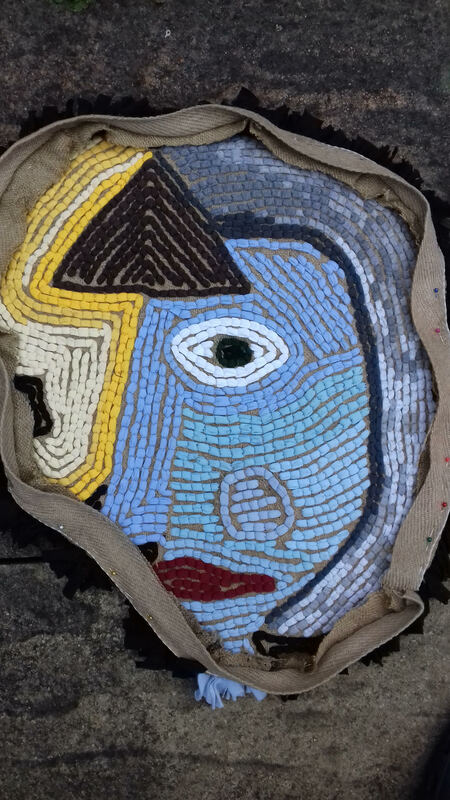 Stephanie is currently working on a Picasso-inspired self-portrait. Stephanie Gaston was kind enough to show us the back of the piece too! What’s your dream rag rug project Stephanie Gaston? My dream rag rug project would be a detailed hooked piece of the Ironbridge which is about a fifteen minute drive from where I live. It has spent a year under wraps being renovated and painted and now looks amazing. My tip to newbie rag ruggers would be to attend a workshop to learn the basics. Stephanie tends to do more of the shaggy rag rug technique, but occasionally does the loopy technique like above. 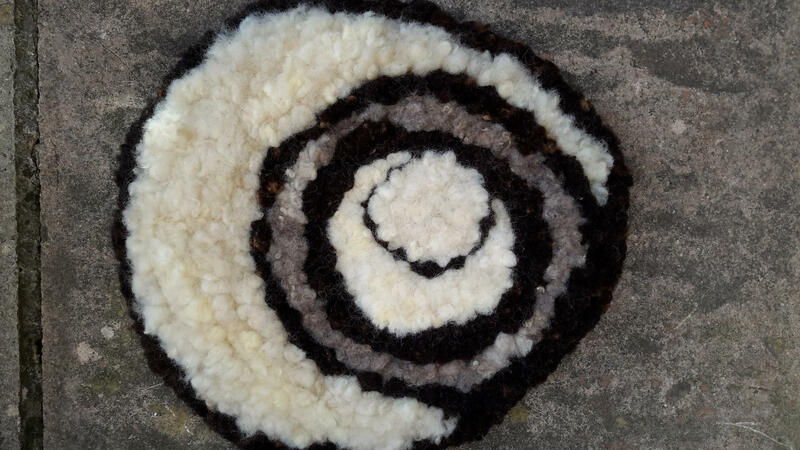 This piece was made using Jacob fleece and the design is based on crop circles. And finally, you may have heard about our 2019 Eco Challenge to be less wasteful in 2019, do you have any tips or tricks to be more environmentally friendly in our day to day lives? Simple hacks very welcome! My tips for the 2019 Eco Challenge are to buy second-hand clothes and avoid food waste. 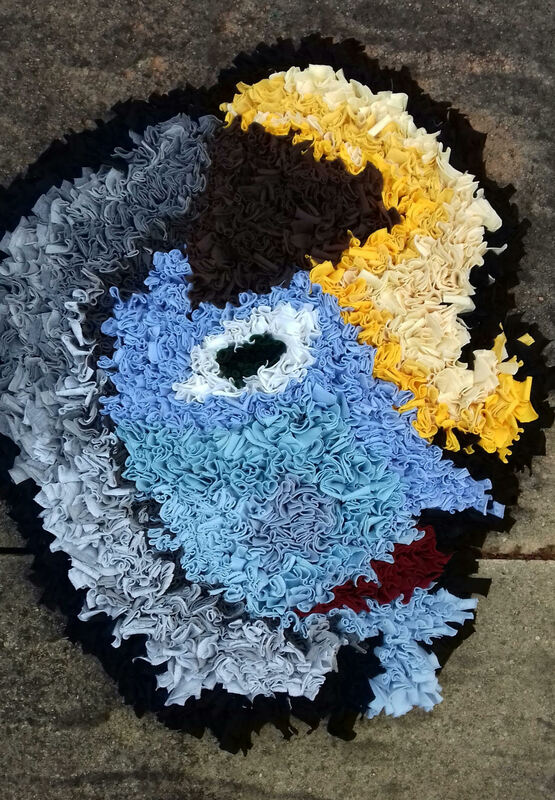 So, that was Stephanie Gaston and her gorgeous rag rug work 🙂 If you’d like to be the first to see future Q&As with rag ruggers, why not join our fortnightly newsletter here or if you’d like to learn how to rag rug then you may want to sign up for one of our workshops here. 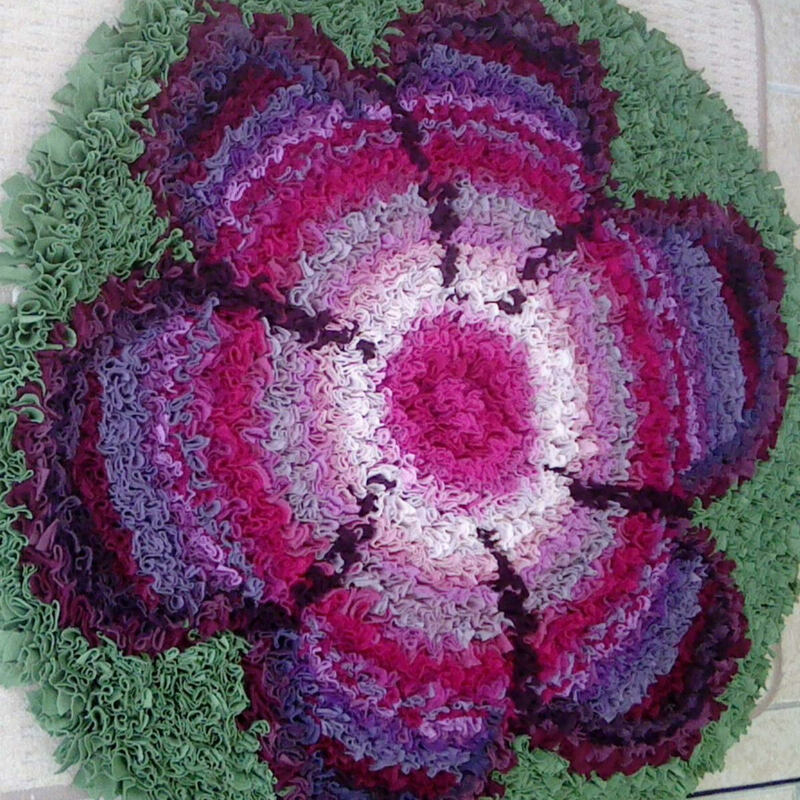 This entry was posted in Designer Spotlight, Inspiration, Rag Rug Designs, Rag Rugs and tagged 2019, Designer Spotlight, Shaggy. Bookmark the permalink.